Call them freaks of nature, weird creatures or even aliens, but these animals are living things and thus, are in need of love and attention. This is why, no matter how bizarre their appearances may be, their owners still love them for who they are. Let’s get to know some of the world’s most bizarre animals. 6-legged lambs – a lamb was born with six legs in 2006 in Meeuwen-Gruitrode in Belgiu. It was owned by grower Maurice Peeters. Another one shocked a Georgian farmed in January 25 when he found out his sheep game birth to a lamb with six legs, four at the front and two at the back. The 5-legged cow – BBC reported that Laxman Bhosale, from India, had a cow born with five legs, believed to “hold the essence of Hindu religion,” and touching its additional leg mean you will “fulfill all your wishes.” Today, the “holy cow” is on tour around the country with it being decorated with beads and fancy fabric and its extra leg hanging out on its back while hauling a fancy trailer. 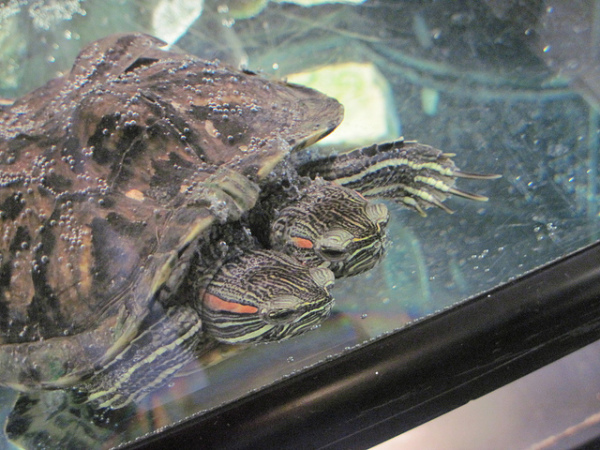 2-headed turtles – one of the two-headed turtles were born in San Antonio Zoo and were named, Thelma and Louise. Another one with two extra legs was displayed at the National Museum of natural history in Kiev, Ukrained in 2012. Todd Ray, believed to have the largest collection of two-headed creatures, also has two-headed turtles in his possession and is even considering having it surgically separated. 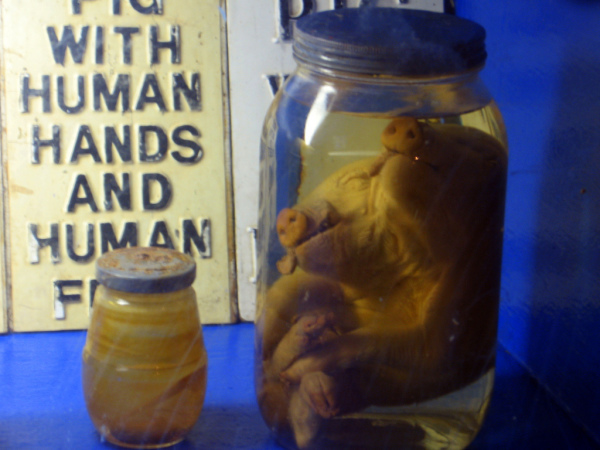 2-headed pigs – a piglet with two heads was freeze-dried after it died in birth for display purposes. It had one body but two heads complete with two sets of eyes and two snouts. One of the litter born on a Deshengtang farm in Jilin province in China was also born with two heads. It can use both its mouths to eat yet appears to be normal, say the owners. 2-headed snakes – one snake is scary enough, so how would you feel if you encounter one with two heads? Quite creepy, right? One of the two-headed snakes in the world is named “Us” born in the World Aquarium in St. Louis. He was a four-foot long carpet python and is 2 ½ years old. Unicorn cow – in China, a cow was unusually born with an extra horn, two on both sides of its head and additional one on the middle. The owners said the third horn used to be a large bump on its head, but grew longer and sharper over time.